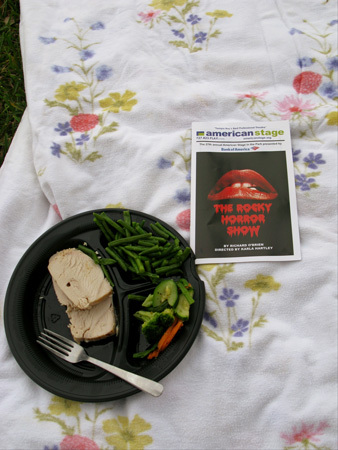 The Rocky Horror Show, at Demens Landing Park in downtown St Petersburg, FL is a hit. Big time. 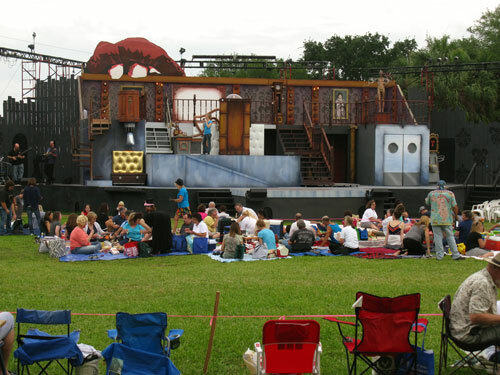 This 2012 edition of American Stage in the Park is the cheap way to spend an enjoyable evening in a tropical park setting right off beautiful Tampa Bay. It runs from April 11 - May 13, Wednesdays through Sundays. Following on the heels of both HAIR, in 2010 and RENT, in 2011, this production is also pushes society's boundaries. 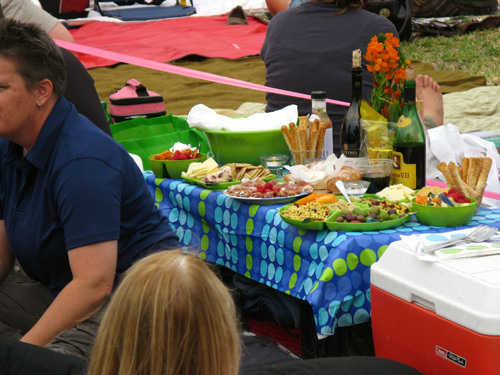 Bring your folding chairs, bring a blanket, and bring your picnic basket. There is no better way to spend a fun, but relaxing night outdoors and be entertained. American Stage has, once again, come through with an intriguing and controversial drama that will have you laughing, participating, and trying to process the deeper messages this show provides. The cool, spring air carries the clean salt water scent off the Bay...and mixes with the aroma of baked beans, sirloin beef tips, and quiet conversation prior to the opening. You'll see audience members in costumes (though not nearly as much as at the Rocky Horror Picture Show midnight flicks) and experience an easy camaraderie between attendees. Don't be shocked if you are asked to share some chicken quesadillas, a beer, or a goblet of vintage wine with complete strangers. 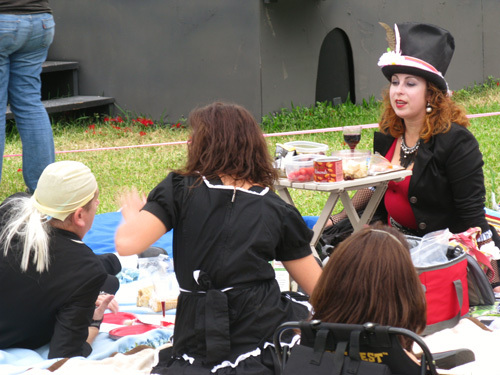 These gatherings for American Stage Play in the Park events seem to bring out the best in everyone. 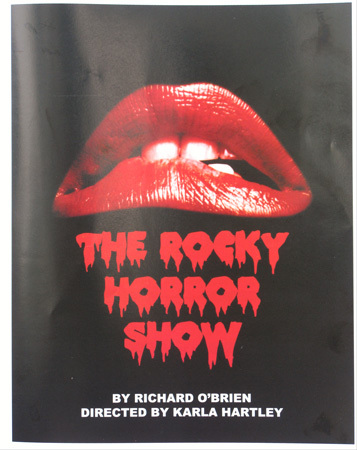 The Rocky Horror Show centers around both the external, and internal dynamics, of a young couple who promise their love for each other in the opening song. He shows Brad and Janet his latest creation...a life form wrapped in gauze bandages submerged in a strange liquid. With help from his assistants, Magenta and Columbia, he brings the guy alive. Clad only in micro shorts, "Rocky" immediately launches into a song during the first 10 seconds of his life. A tough biker comes up to the castle to reclaim his ex-girlfriend, Columbia, but Dr. Frank violently kills him, giving Brad and Janet pause about their own fates. However, Dr. Frank N. Furter has his eye on each of them for sexual adventures...and he will not be denied. The play ends when the hunchback butler, Riff Raff, and his sister Magenta, announce they are heading back to their own planet. Riff Raff goes bananas with a ray gun and vaporizes Dr. Frank, Columbia the groupie, and Rocky, the musclehead functioning on half a brain taken from a delivery boy. If you haven't already guessed, this play is for mature audiences. Get a sitter for the kids. They really do not need to see the silhouetted activity. As you can see, the ushers even get into the spirit of the play. 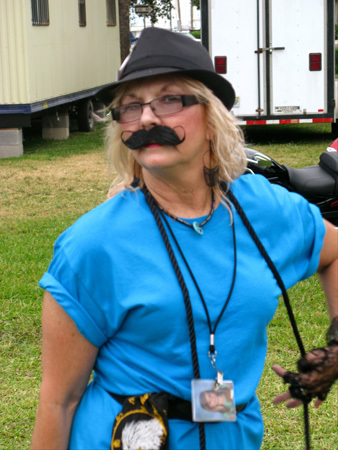 It is okay to dress-up. * You can order your tickets over the phone (727-823-7529) with a credit card, and pick them up at the Will Call table at Demens Landing Park Entrance (Bayshore Dr. & 2nd Ave. S, St. Petersburg, FL 33701). * Bring folding chairs and a picnic basket. It is a lot of fun to have a relaxing meal in this setting prior to the show. * Get there early. The gates open at 6:00pm. Parking is much harder to find in downtown St Pete, after 7:00pm and the lawn seating fills up fast. You CANNOT park inside Demens Landing Park. * Bring sweatshirts and long pants. Once the sun goes down, the breeze off Tampa Bay can get pretty chilly. Some ladies may want a blanket to put across their legs. * Spend $3 to get the Play Guide, it is extremely informative. * Be aware, there is some shouting and a few audience members may act out, but it is not near as distracting as at the midnight movies. 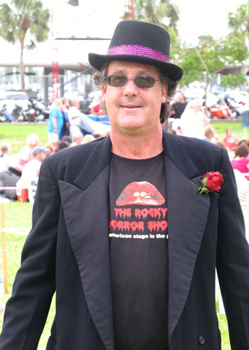 * You can also purchase food, alcoholic beverages, and Rocky Horror Show t-shirts at Demens Landing Park. 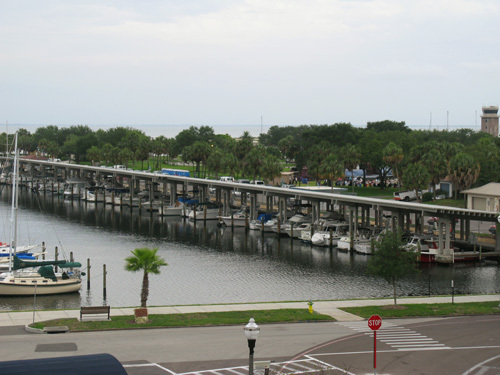 Looking across the South Yacht Basin to Demens Landing Park. As you can see, a lot of hard work went into creating the stage. This is a top notch production. 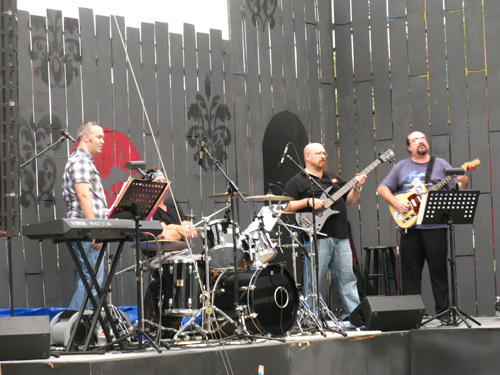 The band is made up of quality musicians, and they provide great entertainment even prior to the play. The cast comes out early to practice songs and get checks from the guys handling the sound system. A lot of the women like to dress up for this play. Some groups put out an elaborate spread to munch on. We just purchased a simple dinner from Boston Market (38th Avenue/4th Street) and had just as much fun. 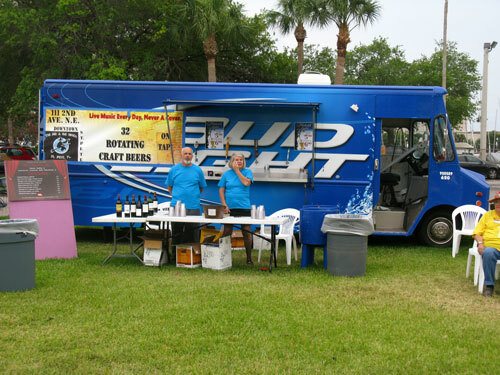 The beer truck is open for business. Go early. The line can get a bit long, sometimes. This cute female usher was already in character. The ushers are extremely helpful. 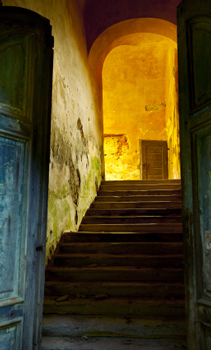 They can answer just about any question you have regarding the arena. 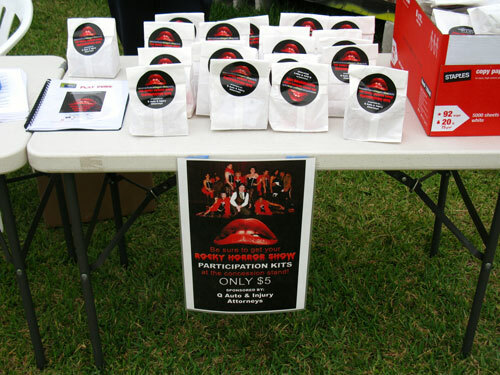 The participation kits only cost $5, and come in a small paper bag. An instruction sheet...about when to use each prop is included. Your date will love being part of the nonsense. 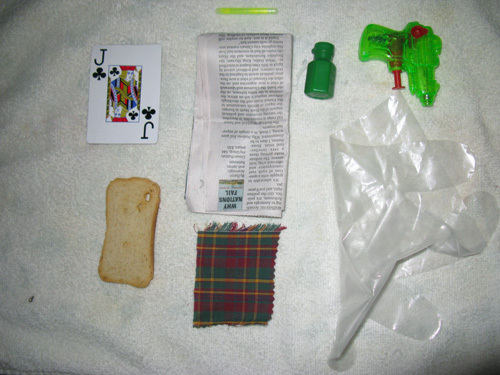 Inside the Participation Kit are: a colored liquid light bar, a playing card, a newspaper page, a container of bubbles to blow, a squirt gun, some Melba toast, a piece of Scotch glen plaid material, and a plastic glove. My girlfriend loved this stuff. At the end of the play, don't be surprised to see all of the women join in the signature dance called, the "Time Warp." St Petersburg, FL is a waterfront city with a lot of charm...and the American Stage Play in the Park just makes it more pronounced. If you are here on a Florida beach vacation, the Rocky Horror Show is an inexpensive way for a couple to spend a fun evening together.